The Scottish Government has plans to invest £463m in 2016 on affordable housing. Read the short article here. That seems to have gone up to £572m according to this internal report. In Scotland (according to Shelter) there are 40,000 homeless people and 160,00 on the waiting list to be re-housed. In Edinburgh at any one time, over 400 people are completely homeless and waiting for some form of accommodation. Household growth in the UK is 232,000 a year and house building can only create enough new stock for 105,000. This is because many new households are comprised of single people or young couples. The recent changes in benefits and the “bedroom tax” have exacerbated this trend. Demand across the whole of the UK is vast and many of the existing new-build proposals are outwith local authority budgets. How Do Our Houses and Apartments Make a Difference? Designed Living Limited offers "Designer" style Apartments and town Houses in "L-Shaped Village Block" Construction on brownfield sites, specifically for Single People and Young Couples, built within cities (which is where most people want to live). All houses are built to exacting specifications in a unique way that ensures completion of agreed projects within 12 weeks. You can see our floor layouts here. Our roll-out projects mean that from the end of 2017 we will be creating Designer housing for over 100 individuals per month. 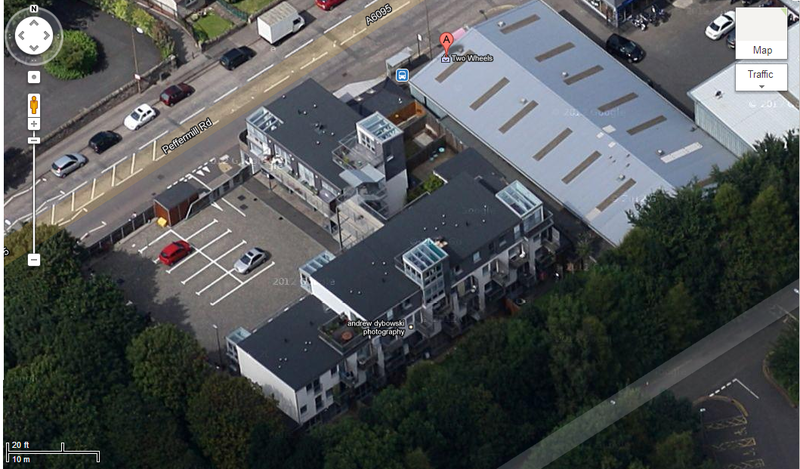 This aerial view shows a completed apartment "Village" with 32 Flats and Secure, Gated Parking. The Glass Roofs are not Stairwells but Conservatory Roofs for seating areas in the 3-Bed apartments. Although only 10 marked car Spaces show in this photo, there are additional Spaces obscured by the trees and also in front of the lower floor of Apartments. The Small Brown Shed is a Secure Recycling Store. The Entrance Gate is Electrically operated and each car owner has a button to open it. Opening buttons are also on the walls of all Apartments. Each Apartment has its own Private Balcony. 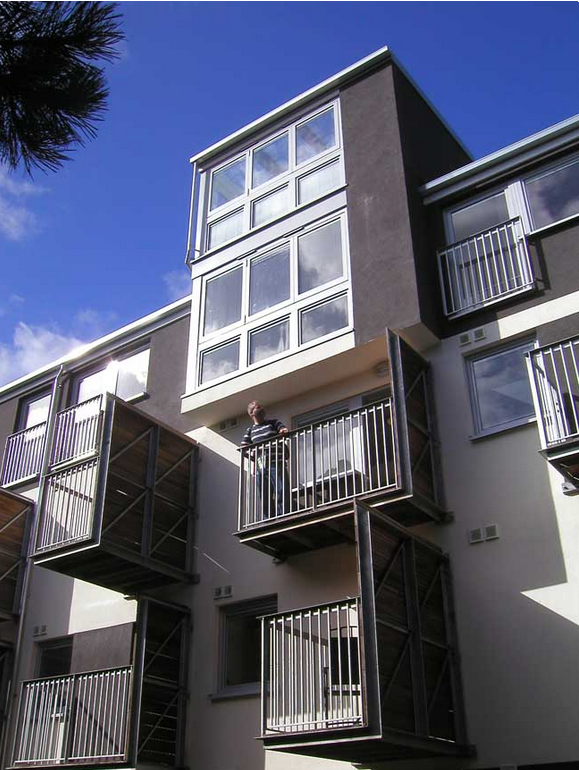 Balconies are designed in such as way as not to intrude on their neighbours but to allow for maximum light. Some apartment balconies on the lower levels have secure, sliding doors for added security. All Double-Glazed Window Units are the same size to allow inter-fitting on the build. This also allows for ease of repair and replacement. Wherever possible in building these micro-villages we aim to exceed building standards. These include local and national Building Regulations, NHBC design standards. All Ground Level apartments have been designed to meet DDA requirements and Part M of the Building Regulations. In this project, the balconies are at the back, facing West away from the main road. Car parking is underground and access is from the quieter side street.